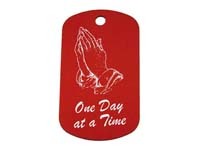 Show your pride, dedication, and positive outlook with our wonderful recovery themed Dog Tags! Our ~NEW~ stylish laser engraved Anodized Aluminum Dog Tags and Coated Steel Dog Tags are available in a wonderful variety of colors and standard designs! Choose from popular symbols, slogans, and recovery themes! In addition, they can be customized and personalized to suit your needs - add a name, recovery date, or special message! We also have a lovely selection of beautiful antique nicodium, antique bronze, and bright nickel plated Die Struck Dog Tags! All designs can be ordered as a necklace or a key tag for the same price! to see all the different models and options within each category! A wonderful selection of fun, colorful, and affordable laser engraved anodized aluminum dog tags! 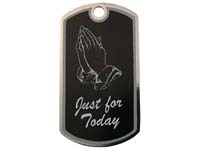 Expertly laser engraved black coated steel dog tags in a variety of recovery themes! 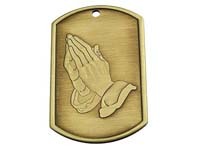 Beautiful antique nicodium, antique bronze, and bright nickel plated die struck dog tags! Have an idea for a cool dog tag? Please, don't ever hesitate to contact us with your ideas! We love working on special projects for groups, facilities, events, and individuals!